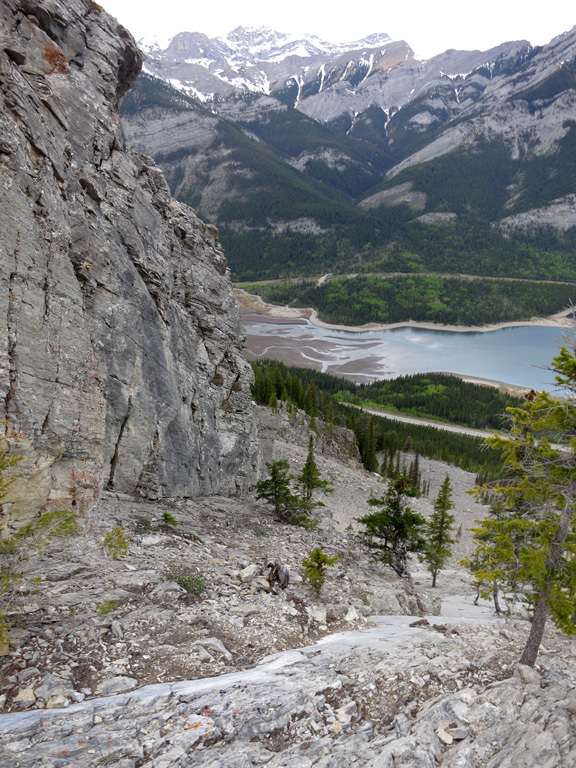 Serving as a gateway for the Elbow-Sheep Wildland Provincial Park and the Kananaskis Region, the three summits of Mt. Baldy, South Baldy and West Baldy make for excellent scrambling trip, offering great views of Barrier Lake, the Kananaskis Valley and dozens of nearby peaks. Starting with a climb of Mt. Baldy, and then traversing to the nearby South and West peaks, the Baldy trio offers a diverse set of challenges over its 7km circuit distance to keep things interesting. The trailhead for Mt. 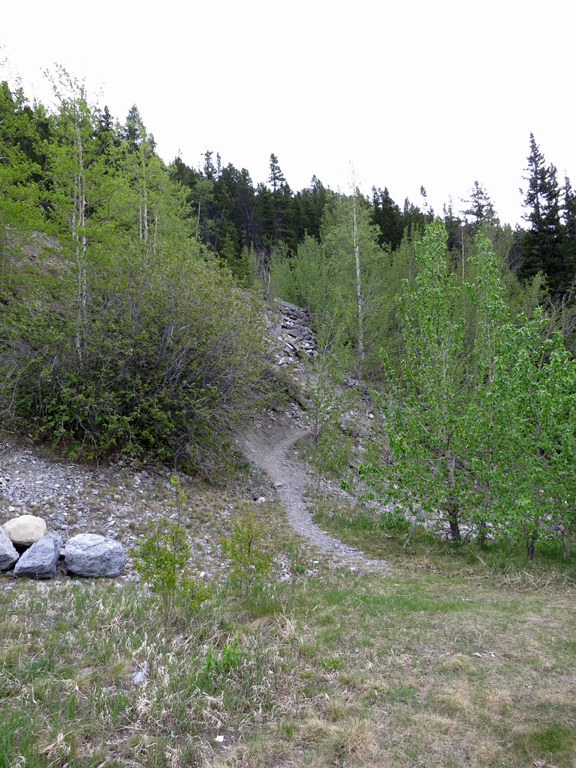 Baldy can be found next to a stream on the east side of Kananaskis Trail (Hwy 40), roughly 13km south of the Trans-Canada Highway (Hwy 1) between the Barrier Lake Picnic Area and O'Shaughnessy Falls (which is easily recognized from the wishing-well). You'll notice two paths initially; one on each side of the stream. Take the left trail and then immediately climb to your left when another trail (with a cairn at the top) appears. This path follows the ascent route to Mt. Baldy, while the other two soon merge and eventually lead to the col between West and South Baldy, which is the descent route for this trip. The climb to the top of the treeline follows a well-defined forest trail, which is continuously steep and will have you nicely warmed-up by the time you reach the first rocky portions of the ascent ridge. Once in this area, roughly an hour into the trip, keep a close eye ahead for a pair of rocky high points of close proximity. 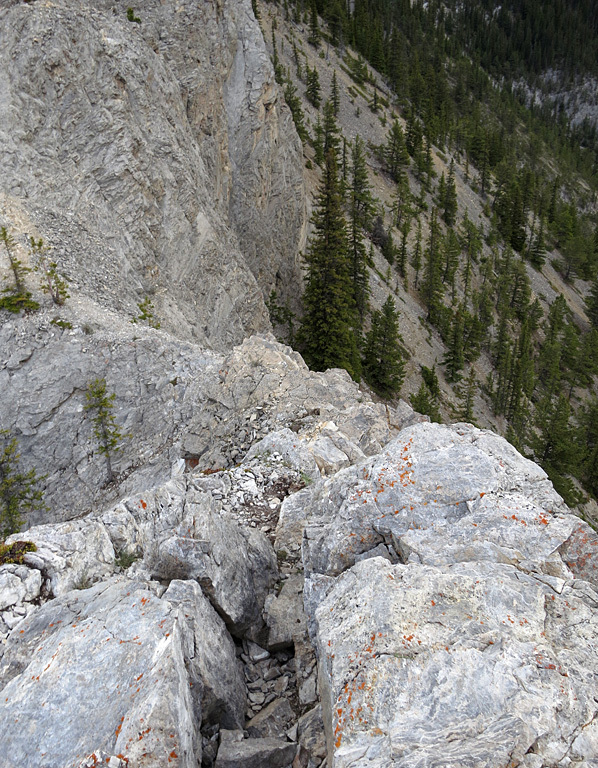 Between the two lies a notch that requires a steep and potentially dangerous downclimb, which is the crux for this trip and can be easily avoided. Despite having read a number of reports about and seeing several photos of the crux area, the downclimb was not what I expected. It's described as a steep 2m downclimb with exposure, and the photos gave me the sense that the route stuck to the centre of the ridge with exposure to a side or sides, which is hardly unusual when scrambling. However, a more accurate description is that the crux is a 2m downclimb of the exposure to a shallow ledge, which then brings you back the ascent trail. 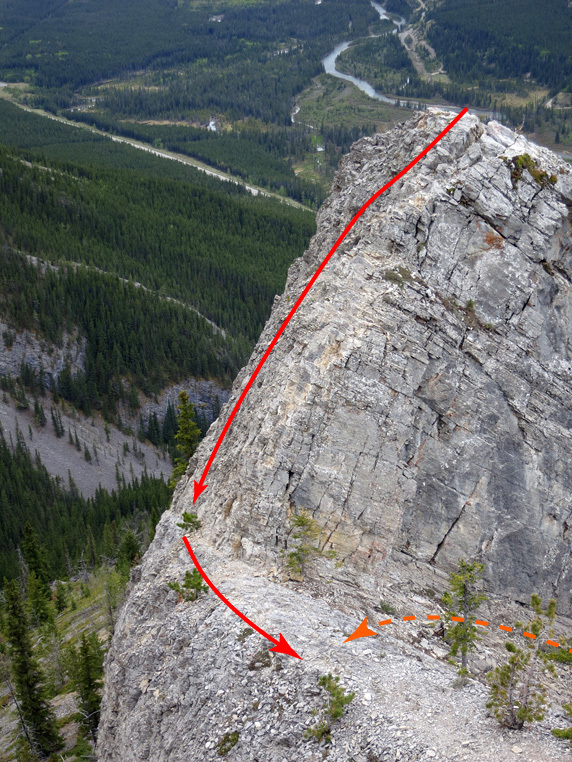 The downclimb isn't technically difficult, as the holds are pretty decent; however, as seen from above and shortly past (the orange line represents the detour route), a slip here could easily result in a 15m/50ft. fall. I made it through without incident, but the experience necessitated taking a few minutes to regain my composure. Thankfully, the crux can be bypassed by anyone who's not purposely looking for a challenge. When you spot the two high points, contour to the climber's left to a scree gully rather than continuing to climb the rocky ridgeline. 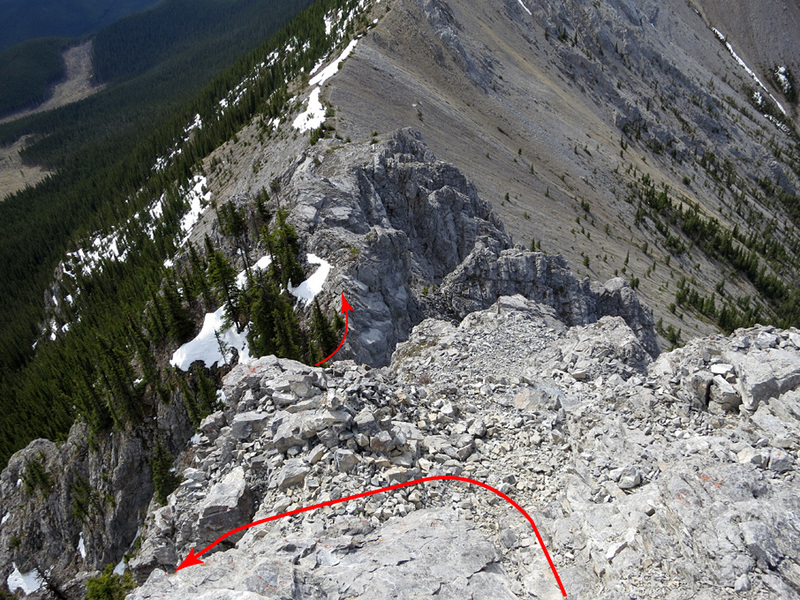 As seen from past the crux, you can simply take a parallel route next to the ridge before rejoining the regular ascent route. The next challenge comes roughly 30 minutes later upon reaching a steep, slabby rockface known as a gendarme. There are three ways past the gendarme, the best of which is to use the many available rock steps and quality holds to climb straight over the centre. 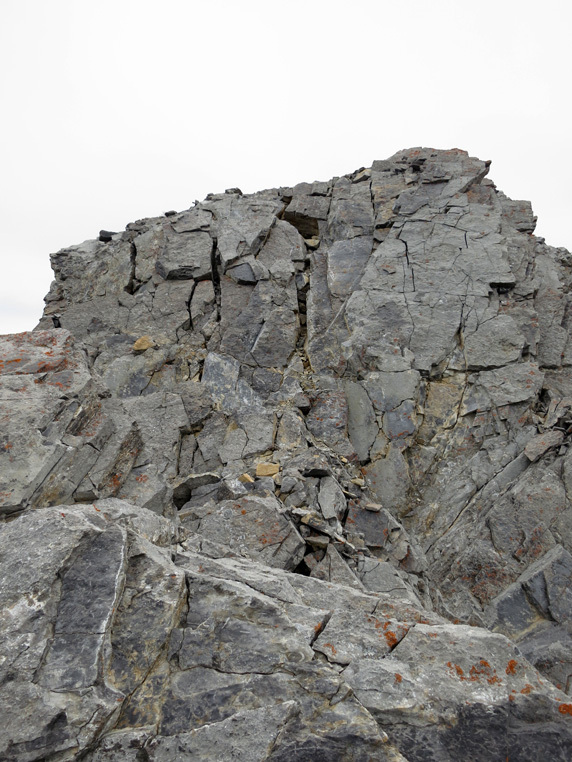 The second option is to look for a cairn to the climber's right and follow that route. As seen from beyond the gendarme, this alternate route exchanges climbing difficulty for exposure along a narrow goat trail; not a great trade in my mind, but it may be quicker. The third route involves descending a scree gully to the climber's right just before the gendarme, contouring around beneath the rock, and then ascending a similar gully on the other side. Unless you're absolutely determined to turn Mt. Baldy into a hike, I'd suggest taking one of the other two routes. The climb to the summit from this area is strictly a hike, with a trail that switchbacks up until reaching the final ascent ridge to the climber's left, where you'll find a quick series of rock steps leading to Mt. Baldy's 2,194m peak. From the peak you can either return along the route you took back to the trailhead, or begin the downlclimb towards the ridge which connects Mt. Baldy to South Baldy. The challenge of the downclimb is one of route-finding, rather than of technical difficulty. Follow the top part of the ridge from the peak southward until you near a point where you can't proceed any further due to a high cliff band. A few steps back from this point on the climber's right is a hidden route (I built a cairn to point the way) that you can use to descend to an adjacent gully to the east (reference photo). 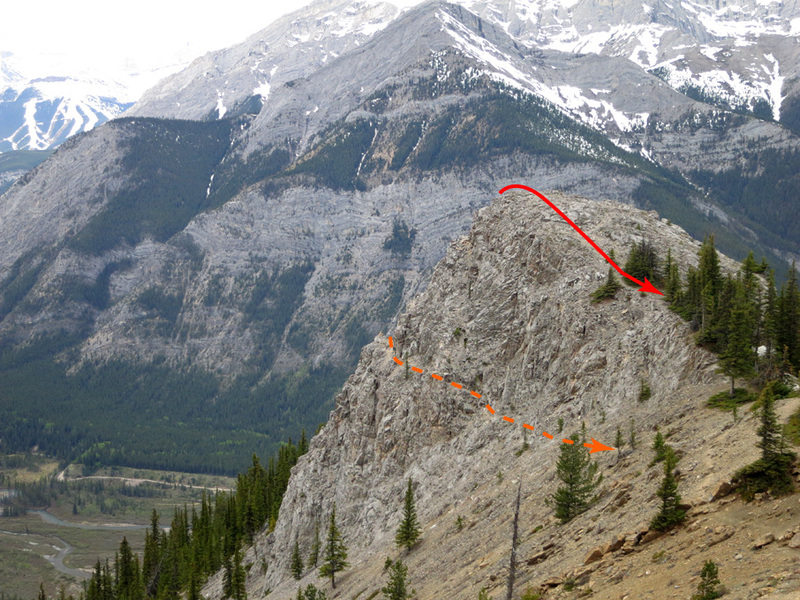 Once on this route, you'll want to contour to the left until you've reached the gully and, from there, maintain as high a line as possible while aiming to quickly regain the southward ridge ( as illustrated here). 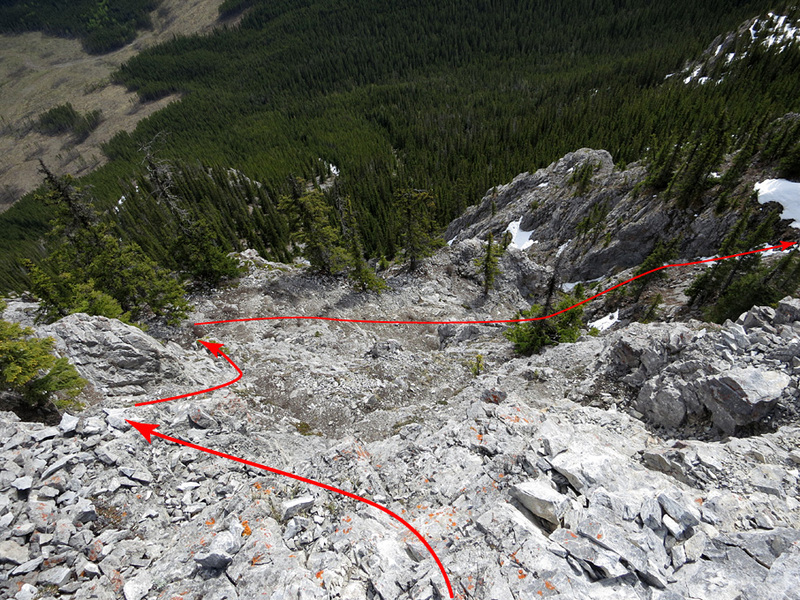 Note that there is a lot of loose debris in this gully that will travel a surprising distance once dislodged; if travelling with other people, be sure to spread out while passing through. You can relax once you've regained the ridge beneath Mt. Baldy's final cliff band, as the rest of the traverse to South Baldy, including the ascent to its summit, is a wonderful ridgewalk. Interestingly, my GPS unit reported that South Baldy was the high point of my day at 2,195m — a full metre higher than its supposed parent peak. Enjoy the views and then follow the obvious trail down the western slopes of the summit towards the South and West Baldy col, from which you can either return to the trailhead (by descending the drainage to a well-maintained trail) or continue onwards to West Baldy, and the third peak of the day. Ascending West Baldy (peak elevation: 2,181 m / 7,156 ft.) is very similar to taking the straight route over the gendarme back at Mt. Baldy; a full-on scramble of similar steepness with decent holds, but with much more altitude to gain. However, this effort won't go unrewarded, as West Baldy offers perhaps the best views of the three peaks. Take it all in, and then re-trace your steps back to the col, where you'll descend the drainage basin towards a casual descent path which winds through a forest area next to a creek, and makes for a pleasant end to another great day in the mountains. 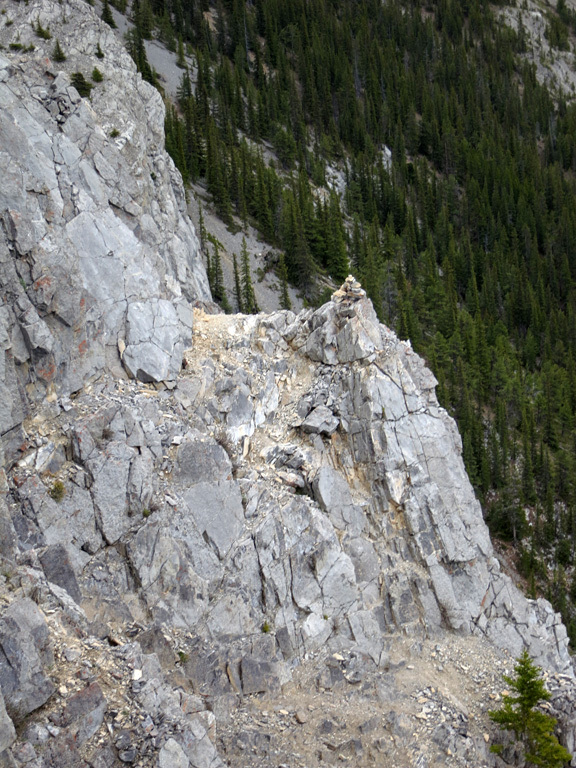 The ascent of Baldy Mountain is also described in Alan Kane's book, Scrambles in the Canadian Rockies. 2,195 m / 7,201 ft.
1,397 m / 4,583 ft.
798 m / 2,618 ft.
348 m / 1,142 ft.